OK, here’s what I want you to do: Take a couple of medium-rare steaks and strap them to your body. Now jump into a large tank containing at least a dozen extremely hungry sharks. 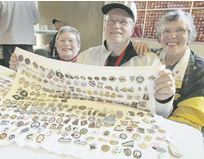 Maxine Forbes, left, her husband Keith and Halga Phillips are among the pin traders attending the 2008 Tim Hortons Brier. Congratulations! Now you know how I felt Tuesday when I wandered over to the pin-trading tables at the 2008 Tim Hortons Brier with a couple of Free Press curling pins clutched in my hot little hands. Eventually, they let me leave, but not before I promised to track down more pins for the other collectors. If I don’t deliver, I’m afraid they’ll be able to find me. I think they can smell fear.